Incredible geological features have formed on this planet as result of water current, natural erosion, volcanic eruptions and meteor crashes. If you’re curious about some of the most striking ones, here’s a look at five stunning geological wonders you need to experience in person. 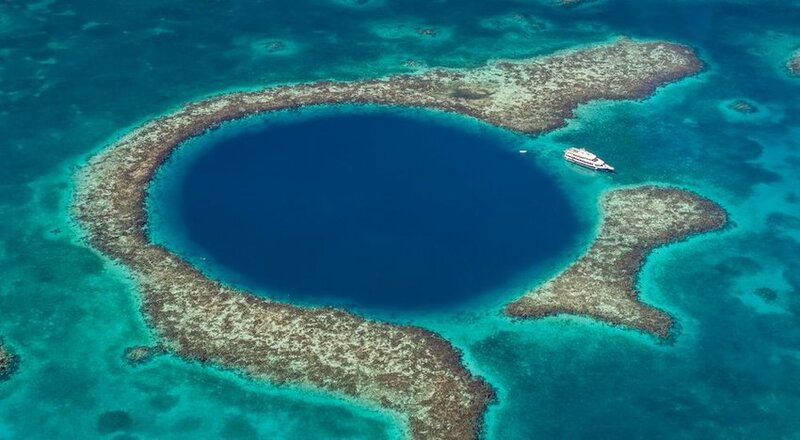 This top dive site in Belize is nearly 1,000 feet across and just over 400 feet deep. Its formation can be traced back to the karstification of limestone. During the last ice age, sudden rising seawaters flooded the cavern, submerging its near perfect sphere. It gained popularity in the diving community thanks to Jacques Cousteau, who came to explore Belize and what lies below the Blue Hole. It’s also part of the Belize Barrier Reef System, which is a UNESCO World Heritage Site. Today, scuba divers flock to the Blue Hole to explore the massive stalagmites and stalactites. If you’re not a diver, you can still experience the beauty of the Blue Hole by booking a tour through either Tropic Air or Maya Island Air. For a really unique experience, you can even take a helicopter over the Blue Hole. 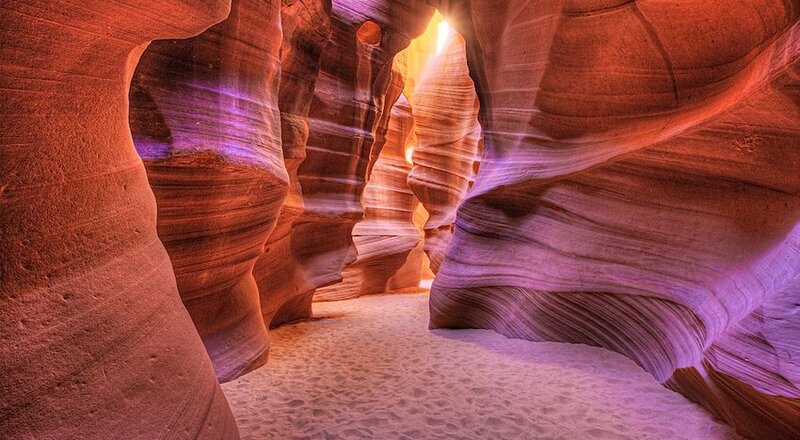 Located in Arizona, Antelope Canyon is one of the most beautiful canyons you can visit in the world. Its Navajo name is Tsé bighánílíní, which means “the place where water runs through rocks.” This slot canyon was created by rock erosion and flash floods from above. The speeding water and sand helped carve out and smooth the edges of this canyon, creating the wider areas seen today. Antelope Canyon sits on Navajo land, and as such, you can only visit in guided tours, which are limited per day. If you want the more private tour for photographers, you’ll want to book as far ahead as possible, as they do sell out daily. What region is home to Europe’s last wild monkeys? If it’s a rainbow of colors you are after, the Grand Prismatic Spring in Wyoming is hard to beat. 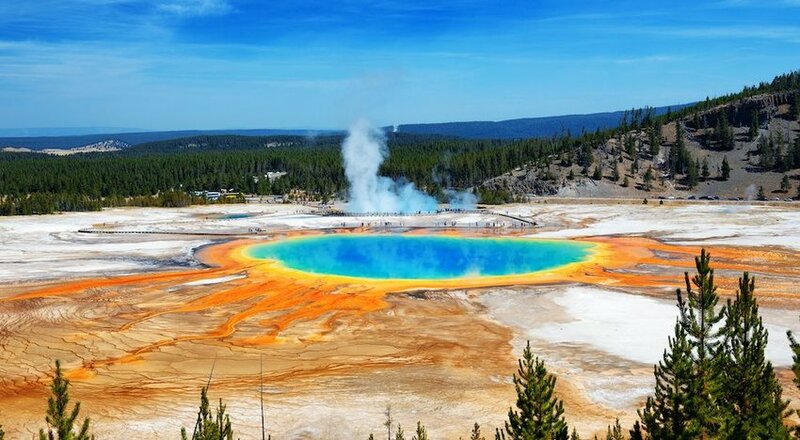 The largest hot spring in the United States, Grand Prismatic Spring is known for its eye-catching colors, a rainbow courtesy of the microbial mats around the edges of the water. The chlorophyll to carotenoid ratio of those mats results in the different colors you see above, ultimately displaying shades of red, orange, yellow and blue. Located in Western Turkey, Pamukkale is renowned for its travertine terraces and thermal hot springs. 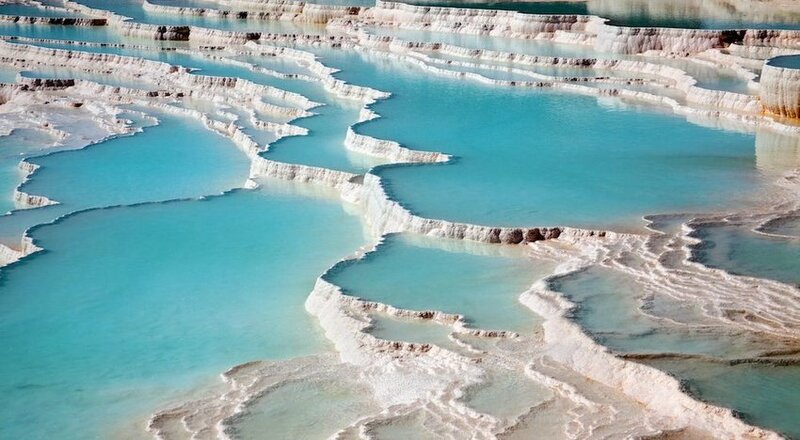 The travertine is formed from calcium carbonate sediment that builds up and deposits in the hot springs water. When the calcium dioxide degasses, the gorgeous terraces with flowing water is what’s left. Pamukkale became a UNESCO World Heritage Site in 1988. Combine your visit to Pamukkale with Hierapolis, which is a Greek-Roman spa city. 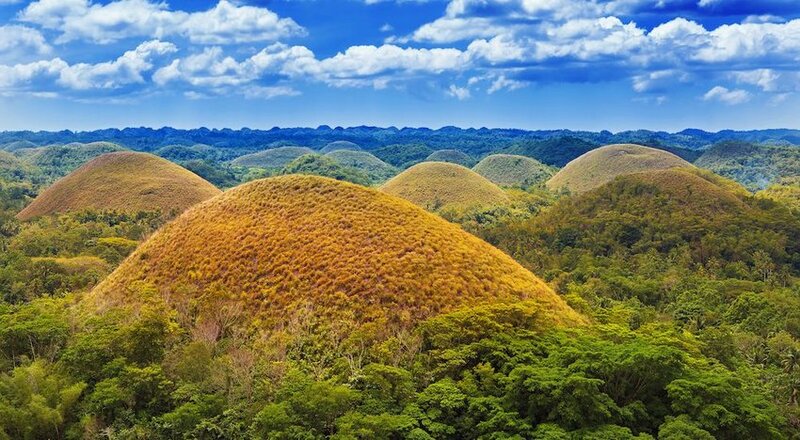 Located in the Philippines, there are over 1,200 “Chocolate Hills,” geological features that get their name from the brown color they turn during dry season. They are rather unique in appearance, and when you see them from the viewing deck, it seems like they never end. The creation of these hills has baffled many geologists who are unsure of how they formed. One of the commonly accepted theories is that marine limestone that sits on top of hardened clay weathered away for thousands of years, forming the tasty-sounding hills. The Chocolate Hills were added as a UNESCO World Heritage Site in 2006. For some of the best views, head to Carmen and Sagbayan, both of which have resorts with viewing platforms.